Front Loaders are commercial solid waste collection trucks equipped with two hydraulic forks attached to the front of the trucks. The forks are used to pick up and dump trash collected in commercial dumpster bins into the box of the truck for compaction. Front Loaders containers work best for businesses that generate low-density waste materials that can be compacted, such as office waste and food products. 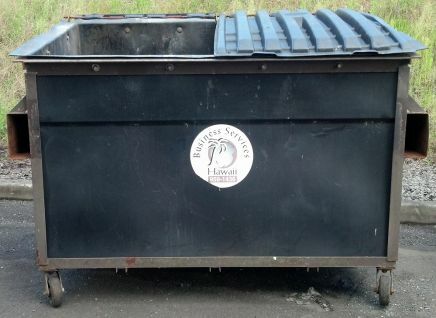 ​All bin maintenance is performed by technicians who are responsible for their condition and appearance. We also offer flexible collection schedules. To request a quote for Front Loader Service, please give us a call or visit our office in Kea'au, Hi for a free estimate. To read the complete county dumping rules, please click here to download the form.